At Conquest Joinery we care for the environment and are committed to producing sustainable and renewable timber products. As a result we also stock an extensive range of used wooden pallets and can offer repairs for your broken wooden pallets. The common Euro pallet is a 1200 x 800mm four-way entry wooden pallet – due to their design they are suitable for use with pallet trucks and we carry a large stock of brand new, A grade and also B grade versions. We also carry a large stock of other standard sized used wooden pallets. Including Chemical Pallets (CP pallets), two-way entry wooden pallets and four-way entry wooden pallets. 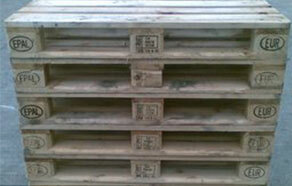 We also carry stock in a range of sizes, including the standard 1200 x 1000mm four-way entry wooden pallet. If you are not sure what type of pallet you need, or its specification then please contact-us to discuss your requirements.